"My young pup responds to the dual tone whistle." My young pup responds to the dual tone whistle. Amazing! Leaving in 3 days for pheasant hunt and Gun Dog Supply had extra dual tone whistles to me immediately! "Just bought several hundred for our Sheriff's Office"
Can't wait to use it outside. Weather has been below 0. So far, it's way too cold to train outside. Have been doing it in house. Just a note, I would put a better lanyard w/ your name on it, which clips on and off. Also, good advertisement for your company while trainers like me and others in upstate NY are out training and competing our dogs. Just a thought. Won't cost much. Just bought several hundred for our Sheriff's Office, and it was very cheap. "The dogs come immediately when I blow the whistle." AKC German Shepherds. Family pet. The dogs come immediately when I blow the whistle. The whistle represents an instant recal for the 2. Love this whistle. I won't go in the field without it. I always keep spares on hand. Works great. "I'm going to be getting a puppy, and the training book I have been reading recommended that whistle." I'm going to be getting a puppy, and the training book I have been reading recommended that whistle. I can't wait to get into the training mode with my puppy. "It is the ONLY whistle we use." It is the ONLY whistle we use. "I have used these for 20 years!" I have used these for 20 years. It is the sound I am used too. I always buy several just in case they stop being made! Seems to be a good whistle. I like the dual tones, up close and far. Shipping was fast. "Great for training a dog to come on the regular whistle and whoa on the other." Could be sturdier in the way the lanyard connects to the whistle. That's why I always order two. Great for training a dog to come on the regular whistle and whoa on the other. "Like my whistles and appreciate your service." Like my whistles and appreciate your service. We preach to all of our puppy buyers that they should use dual-tone whistles so they can use the Halt command as well as other come/turn/go commands conveniently with one whistle. 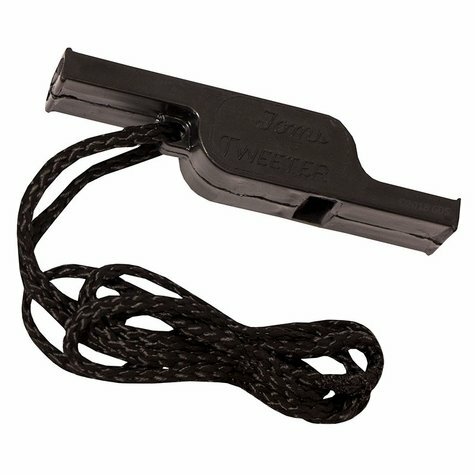 This whistle doesn't have the best sound quality, but it works well for they money and that is why we always buy them for the puppy kits that go home with our puppy buyers. Not so great for what I had in mind - retrieve directions - but AWESOME to get attention of the entire pack, interrupt barking, and draw attention away from distractions. I'm wearing it daily. "It fell apart as soon as I opened it." It fell apart as soon as I opened it. I had to reglue. It works ok.
One side doesn't work at all. Got an athletic whistle instead. Product Rating: 1 out of 5-stars. More Commands than any single whistle. One end has a bead, the other is beadless. This whistle comes with an attached lanyard. Made in the USA. Beadless: to come, release, or retrieve and directional signals. Beaded: for down, stop or whoa.